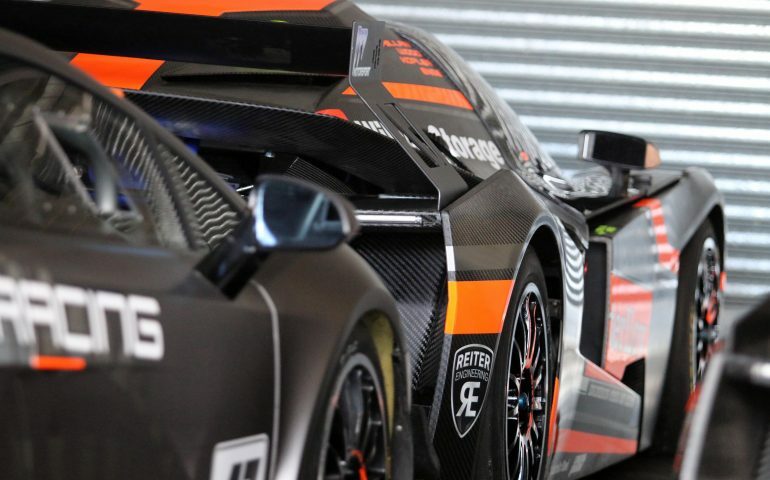 THE BEST GT teams from Australia and around the world have begun to arrive at the Mount Panorama circuit today. Despite on-track action not commencing until Friday, teams begun their setup process today in warm yet overcast conditions. A host of personnel from Nissan Motorsport were amongst the first on the scene, unloading their pair of GT-R NISMO GT3 entries and a host of spares and pit equipment into their prime pit entry real estate. Team RJN boss Bob Neville – who heads up Nissan’s Blancpain attack – and drivers Alex Buncombe and Florian Strauss were also on the scene to get acclimated. Next to the Nissan garage, M Motorsport unloaded their KTM X-Bow ahead of it’s first race on Australian soil this weekend. Further down pit lane, STM arrived with their Mercedes AMG GT3, while their sister car – also to be run by HTP Motorsport – was also seen in pit lane as the team built the pit equipment around it. Towards pit exit, the curvaceous behind of the Maranello Motorsport Ferrari 488 GT3 appeared from within the team transporter. A huge amount of resources goes in to making a Liqui-Moly Bathurst 12 Hour campaign happen – and it was perhaps best demonstrated by Nissan’s factory outfit, running two cars in the race for the first time. As well as the spectacularly liveried transporter that brought the two cars up from the Nissan Motorsport base in Melbourne’s Eastern suburbs, plenty of gear also arrived via shipping container – including the pit walling, spare wheels and a host of spare parts to ensure both cars could be serviced this weekend. Set up continues tomorrow, with all teams expected to be in the precinct by 5pm tomorrow afternoon. Click here to find out how to follow the Liqui-Moly Bathurst 12 Hour this weekend.